Review of Holt - "THE ELECTION OF 1860: A Campaign Fraught with Consequences"
When it comes to writing about the election of 1860, the tendency of most authors is to focus on Abraham Lincoln. This is reasonable. After all, Lincoln's life story appeals to 21st century sensibilities and his rise to the pinnacle of political power in America was uncommonly dramatic. Plus, he was the winner after all. 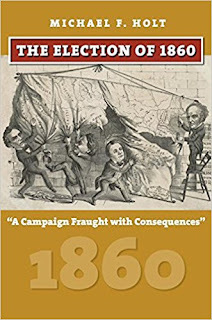 However, Michael Holt's The Election of 1860: A Campaign Fraught with Consequences reminds readers that it was parties and platforms, not individual candidates, that most typically ranked highest in the minds of 18th century voters, and the great majority of the U.S. electorate (just over 60%) wanted nothing to do the new political powerhouse in the North. Unfortunately for them, a united anti-Republican opposition proved impossible, and the fractured sectional parties that emerged from that failure to craft a unified front almost certainly ensured a Lincoln victory in 1860. Right at the top, it should be mentioned that The Election of 1860 offers in the most general sense a very good compact descriptive account of the overall election campaign. In engaging fashion, Holt introduces the four presidential candidates [Republican Abraham Lincoln, Northern Democrat Stephen A. Douglas, Southern Democrat John C. Breckinridge, and John Bell of the Constitutional Union Party] and effectively defines the election's chief political issues. The oft written about party convention process and Democratic split are similarly well presented. The most important features of the various party platforms (all four of which are reproduced in full at the back of the book) are also thoughtfully assessed throughout. The events of election day itself are not a major focus of the study, which is more concerned with interpreting the results. Among other things, the rapid rise of the Republican Party confirmed the old saw that, as with so many other things in life, 'timing is everything' in politics. According to Holt, a significant Republican voting block in the North was primarily motivated by event-driven disgust with the undemocratic actions of Democrats (ex. the Kansas-Nebraska Act, the Lecompton Constitution, the Sumner caning, etc.) rather than ideological conversion. As will be discussed more below, Holt's research uncovers a perfect storm of voter disenchantment with the Democratic Party in 1860, all of it perfectly timed to help put the Republicans over the top. Throughout his narrative, Holt argues that the Republicans of 1860 were able to successfully portray themselves as the only antidote available to the naked corruption of the prior eight years of Democratic governance. The Buchanan administration in particular offered a target-rich environment for cutthroat propagandists, and the admittedly less than impartial Cavode Commission made the most of its mission to expose Democratic corruption. The book highlights a few of the most glaring examples of misrule, including bribery of politicians and fraudulent cronyism in awarding government contracts. Of course, one can point to abuses of power in all parties, but in politics (as in so many other things) perception is often more important than reality, and Republican newspapers and other anti-Buchanan forces seem to have been particularly successful in painting Buchanan Democrats as exceptionally corrupt. Tying official corruption to wedge issues of the day only made it worse for the Democrats. Public outrage became white hot when it came to light that the administration blatantly attempted to buy votes accepting Kansas statehood on the basis of the much-reviled proslavery Lecompton Constitution. Other examples are introduced throughout the text, but Holt might have made his central argument for the underappreciated centrality of this election issue even more forceful by devoting an entire chapter to detailing the allegations and showing readers what effect the accusations had on voter attitudes and calls to action. Really, the corruption angle seems worthy of of its own standalone study. Another traditional interpretation that Holt rejects is the popular idea that Lincoln became the most acceptable compromise candidate at the Republican Convention due to widespread perception of his being less radical in his views than New York's William Seward and Pennsylvania's Simon Cameron. One might reasonably argue that Seward was less of a hardliner toward the South than Lincoln was, and it is Holt's position that Lincoln was more acceptable to the Lower North not for his comparative conservatism but for his geographical roots in the growing West. It also helped Lincoln's cause that he was considered "clean," while eastern party giants like Seward and Cameron were contaminated with the very qualities of corruption that the party was trying with much success to pin on the opposition. Holt is in all probability correct that the election shorthand most commonly employed by historians breaks down the 1860 contest as Lincoln vs. Douglas in the North and Breckinridge vs. Bell in the South, but the author convincingly paints an alternate picture of the Lincoln opponents (particularly the Democrats) maliciously targeting each other far more than the they did the common Republican enemy. The candidates also often talked around each other rather than directly addressing the same points. With the success of antislavery forces in Kansas, most Republicans had by 1860 determined that the issue of slavery's extension was settled in their favor, at least in practical terms. In Holt's estimation, it was the Southern Democrats, not the Republicans, that were determined to keep slavery rights in the territories as a major campaign issue. As stated before, instead of concentrating on the issue of slavery's extension, Republicans tried to portray the election as a referendum on Democratic governance. Seeking to win the middle ground, Bell and Douglas both wanted to save the country from extremism in both forms (Republicans and Southern Democrats). Bell's Constitutional Union Party attempted to remove slavery from the discussion altogether, and its platform was justifiably mocked by all sides for its simplistic appeal to commonly-held constitutional principles. Breckinridge above all wanted to defeat Douglas and was more concerned with ensuring equal property rights of southerners in the abstract sense than he was in than demanding an actual slave code for the territories. The author also helpfully points out that the competing Republican and Democratic campaigns were not as exclusively sectional as most accounts would have us believe. For example, Breckinridge partisans held rallies and actively sought support in the North while Douglas (the only candidate to personally campaign) traveled all across the South and was in Alabama on election day. Even Republicans were able to drum up a presence in a few Border State and Upper South counties. In the book, Holt credits Republicans with the 1860 campaign's most innovative political strategy for drumming up support among younger voters, especially those not old enough to have voted in 1856 or who stayed away altogether. A grassroots pro-Republican political organization, the Wide Awake movement exploded in popularity in the run-up to the election, with chapters springing up all over northern cities. With the military-style pageantry of their torch-held night parades, the Wide Awakes impressed (and recruited) numerous onlookers while at the same time intimidating opponents with showy projections of strength right in the heart of traditionally Democratic cities. According to Holt, these chapters played a significant role in the Republican victory. Similar marching clubs did emerge among the other factions (one of the most colorfully named, the pro-Douglas "Chloroformers", sought to put the Wide Awakes back to sleep! ), but, at least in the North, they couldn't match the organization and scale of the Wide Awakes. In general studies of the 1860 election, John Bell always gets the least amount of attention (and the dearth of useful Constitutional Union Party sources that Holt lists in his bibliographical essay seems to bear this out), but Holt devotes an appropriate amount of space and analysis to the man who finished fourth in the popular vote but secured more than three times the number of electoral votes that Douglas won. Holt's account depicts Bell as a prescient man who honestly feared the consequences of sectional party victory yet employed badly misguided and surprisingly naive political tactics in his own campaign. Bell unsuccessfully attempted to position himself as the only true national candidate in the election and the only viable alternative to the extremists that threatened the Union. To Bell, Breckinridge and his supporters were outright secessionists while the Republicans, already victorious on the slavery extension question, had already outlived their reason for existence. In Bell's view, virulent anti-southern rhetoric from Republicans only strengthened secessionism. But his party's impractical "empty" platform and widely scoffed at presumption that simply removing slavery from national discussion would solve most problems of unity meant that his movement never gained enough traction to achieve even its most modest goal of throwing the election to the House of Representatives. Returning to the corruption issue, as Holt maintains in the book the Republicans of 1860 were in urgent need of a new weapon in their political arsenal. It was needed because all sides recognized that the election would be truly decided in the North, and the anti-Lecompton Douglas, the avowed enemy of the Southern Democrats, could not be branded by Republicans as the tool of the so-called Slave Power. Other issues would be popular in particular states (for example the Homestead Act in Minnesota or protective tariffs in Pennsylvania), but it would be the Democratic corruption exposed by the Cavode Commission that would provide the best ammunition for Republican operatives. Guilt by association would apparently gain purchase and stick to Douglas even though everyone knew the Little Giant himself was a bitter enemy of the arch-corrupt and inept Buchanan administration, the clear center of gravity when it came to accusations of public fraud and overspending. Holt's remark in the book about the absence of scientific polling data rendering it impossible today to truly know what political factor was first in the minds of Republican voters is surely accurate. However, his view that there was widespread belief at the time that only Republicans could return honest government to Washington, and this growing conviction might very well have been the leading inducement for many to vote Republican in 1860, seems reasonable. One of the major Republican objectives was to win over the hundreds of thousands of voters that chose "Know Nothing" American Party candidate Millard Fillmore over John C. Fremont in 1856. 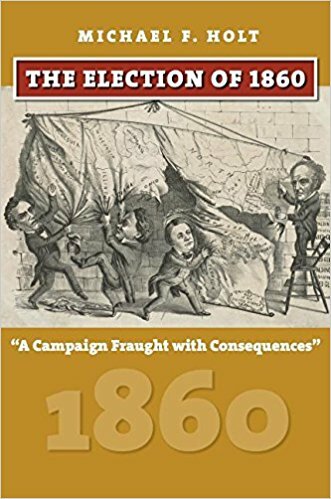 As the book demonstrates, the political landscape of 1860 was very different from 1856. Compared with four years earlier, in 1860 the practical prospects of slavery's extension were greatly muffled and disgust at dishonorable government far more elevated in the public consciousness, so it might stand to reason that the great majority of Fillmore voters that went Republican in 1860 were moved to that action by the public scandals of the Buchanan presidency. In the final chapter, Holt effectively uses William Gienapp's statistical study of the election to identify and comment upon compelling trends in voter background, affiliation, and turnout (the appendix section contains four election return and voter turnout tables helpful for comparing 1856 and 1860 data points). Holt also usefully reminds readers of how critical October election returns (particularly the gubernatorial races) were seen at the time as predictive of November results. In this case, Republican confidence was soaring on election eve in November. It's become more popular of late to discount the significance of the affect of the Democratic split on Lincoln's victory, but Holt cites more than sufficient evidence regarding large-scale problems in Democratic turnout stemming from defeatism (due to both party infighting and October election results) to question anew the modern skeptics on this point. Convinced or not by Holt's arguments regarding the key role played by Democratic corruption in the Republican electoral triumph in 1860, there appears to be little doubt that the issue was at the very least a significantly important one to the voters. Indeed, on points large and small Holt's study contains innumerable unconventional but reasonably supported interpretations that question prior assumptions in an intellectually sound manner. A great addition to the scholarship of late antebellum national politics and the four-way presidential contest that finally transformed long-standing threats of southern secession into tragic reality, The Election of 1860 is highly recommended to seasoned students and new readers alike.